You can often get a hysteresis effect for the Flow versus Depth relationship in SWMM 5 due to the five component St. Venant equation used to simulate the flows (http://swmm5.blogspot.com/2010/12/what-are-units-for-five-st-venant-flow.html) . A hysteresis effect is having two or more flow values for the same depth value in the link. 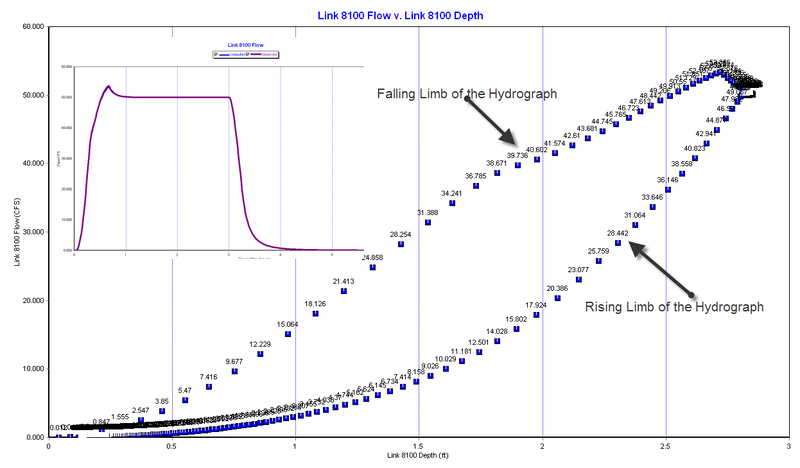 For example, this image shows how the link 8100 has a different flow for the same depth in the rising and falling limb’s of the hydrograph. This is due to the different values for the upstream and downstream head, hydraulic radius and cross sectional area during the falling and rising hydrograph, respectively.